Rata grow in coastal to lower montane forests, the northern (Metrosideros robusta) throughout the North Island and in the north-west of the South Island, and the southern (M. umbellata) mainly on the western side of the South Island and on Stewart Island. 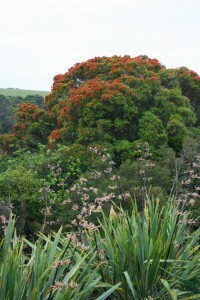 Northern Rata grows up to 30 metres tall with a trunk up to 3 metres in diameter, and the southern rata about half those dimensions. Northern Rata commonly start life as an epiphyte and send roots around the trunk of the host tree eventually joining up to form one single trunk. The northern rata’s bark looks rather like that of a pohutukawa but the Southern Rata is covered in pale papery bark that peels off in strips. The leaves of both trees are a similar deep bright green, thick and leathery, the northern up to 50mm long and 20mm wide, the southern up to 75mm and more pointed. Northern rata flowers are a spectacular bright red to dark-crimson appearing at the same time as pohutukawa flowers (with which it can be confused); Southern Rata flowers tend to be more vibrant. colds. Young rata leaves were chewed for toothache. The nectar was used by Maori for sore throats. 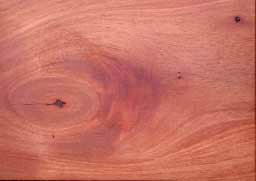 Rata wood is a dark reddish-brown and the heart-wood may be plum-coloured with purplish streaks. It is dense, heavy, and immensely strong. Southern rata is the world’s second densest wood (after lignum vitae). The wood and its grain are often very distorted because of the way the tree grows and hollow trees are common. It shrinks considerably on drying, is hard on machinery, and is not very stable in use, nor is it very durable. Timber has been used for bridges, ship’s timbers, houses, furniture, and is very hot burning firewood. The timber is popular with woodturners because of the beautiful, warped reddish grain, but it can be very difficult to turn when it is dry. Northern Rata tends to produce hair-cracks, burrs are very hard to turn, but it holds its colour well, while Southern Rata is far less stable and is therefore better used for smaller pieces which will distort less.